For Jon and other Hitchcock enthusiasts: The House Next Door has a conversation piece by Jason Bellamy and Ed Howard on "minor" Hitchcock, particularly To Catch a Thief and Rope. Since I'm less interested in Hitchcock, I haven't read it yet, but their discussions are usually very interesting and insightful. That's very good, Matthias, thanks for the link. I like their optimistic tone, though I haven't read it all yet. Don't get excited! The final review, for now, still eludes me. Meticulously restored, allegedly. 5.1 remixed sound, apparently. Pre-ordered, definitely. Psycho. 50th Anniversary. Blu-Ray. It's all good! Ack. And you just had to share didn't you. Another one to add to my list...I need to hit the lottery to pay for all this I think. Yes, in the announcement I saw the author pointed out Universal's shaky track record with Blu-ray ports, how they occasionally fail to create new transfers. Universal's own blurb seems confident at the moment at least. Um, yeah. Better than announcing "we are putting Psycho out on Blu this year, but we'll use the old VHS master"
When a wealthy woman unwittingly hires a con man and a phony psychic to find her missing heir, the results are diabolically funny in Alfred Hitchcock's tongue-in-cheek mystery thriller. Bruce Dern and Barbara Harris star as a conniving couple plotting to bilk an old lady out of her fortune by pretending to find her long-lost nephew (William Devane). Meanwhile, Devane, a larcenous jeweler, and his beautiful girlfriend (Karen Black) have kidnapped a rich Greek shipping magnate for ransom. Together they're on a nonstop merry-go round of mystery, murder and mayhem that combines suspense and comedy for unforgettable entertainment. And so we come to the final Alfred Hitchcock film. It would be easy to make excuses for it, coming at the end of such an illustrious career that encompassed some of the greatest and most important films ever made, but the truth is, we don't have to. It's a great little film that is unmistakeably Hitchcock throughout and shows he never rested on his laurels. 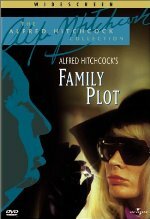 The key thing about a typical Hitchcock plot is the simple, delicious premise and a claustrophobic situation, entrapping the central character. Family Plot doesn’t really have that. Essentially it’s two separate threads, but the light, farcical story by Ernest Lehman, built around a hugely ironic premise (jewell thief trying to do away with a couple who are simply trying to help him! ), is still very enjoyable. There is a nod to previous ideas with the notion that the perfect murder was committed years before and gotten away with. For now. The film opens with Barbara Harris as fake spiritualist Blanche in the middle of a session with Julia Rainbird (Cathleen Nebitt) and being offered $10000 to track down –psychically- the only heir to her family fortune. We are then introduced to Blanche’s partner, taxi driver George Lumley (Bruce Dern) as they try to work out how to find this man who nobody knows. There is a neat switch to Karen Black as jewel thief Fran completing an audacious kidnap plot by silently collecting the ransom from a police station and taking it to William Devane (Arthur Adamson aka Edward Shoebridge, the guy Blanche will be looking for). It’s a grand and theatrical introduction for the second couple, including a brilliant reveal of a helicopter, almost like a magic trick. The neat hiding of the diamond makes for a couple of nice shots later on too. Harris and Dern might not get the obvious set-piece to grab the viewer with, but you will quickly warm to their endearing partnership. Harris (Freaky Friday) in particular works her socks off throughout and is very funny. And this is one of the best roles I’ve seen Dern in. Not because it is particularly difficult, but he often plays characters that are difficult to empathise with. The jewel thief couple are more style over substance, but Karen Black does well with the thinnest role and William Devane is always worth watching, especially his smooth dealings with detectives who visit his jewellers (note his lapel picking to disarm them). Ed Lauter also pops up as a thug and does very well to be a viable threat in what is too light a story to handle anything really terrifying. Most of Hitchcock’s American films had huge star power, but this had undone his later films. Marnie and Torn Curtain had the stars, but they were awkward, detached, incapable or all three! Topaz had the characters, but not the stars to pull them off. As if realising a change of gear was needed, in Frenzy he worked with a lesser-known, but a more capable and balanced cast and the story was tailored to suit them. Family Plot is the same and works very well for it, although at some cost to the epic visual style his best work is known for. Still, he rarely handled comedy well for that very reason, so this is a treat. There is one set-piece that acts as a nod to North By Northwest and the preceding car accident hilariously demonstrates Hitchcock’s grasp of the absurd cinema he helped create and reminding us a little of the humour he injected into Foreign Correspondent. The low key setting, wider focused plot and cast of unknowns, can’t help but lend the film a touch of TV movie (though somewhat deflected by John Williams’ score), but rather than be a detriment, it simply highlights the director’s skills in composing a scene, or building character and dialogue. For some reason, I particularly noticed the sound design based on his earlier tricks to hide exposition; watch how he uses a radio to drown out dialogue and then has the characters complain so it gets turned down. It’s almost as if they acknowledge that the audience can’t hear them! And if you think that comes close to breaking the fourth wall, well just wait until the end! It’s a silly grace-note once the plot is done with, but cheeky Hitchcock clearly understands it can only work if the audience is complicit. After his later American movies had seemed old fashioned in structure, like he was falling back on older, more reliable roots, it seems like Frenzy had given him a new direction. Tone down the visual and concentrate on a dependable, solid cast and a likeable premise. As such this is a fine swansong that while lacking the pure cinematic power of, say, Vertigo, nevertheless intrigues by suggesting what might have been. Certainly the great man was not running on empty and we couldn’t ask for anything more. Someone play the Chariots of Fire theme, because I'm done! Well done indeed. I am yet to actually finish a marathon but I can only assume how good it would feel. I will finish this someday. I hope. I need to make myself another list..I lost the other one somehow.